Back in the late 90's, I visited Catalina Island and was surprised to see that most automobiles aren't allowed there. -Instead, tourists and the indigenous populace ride around town on golf carts. -That works out just fine because the local geography and short distances between tourist traps doesn't lend themselves to speeds any greater than that which could be achieved on a moped, and the absolutely perfect climate doesn't create any desire for it. Catalina is at or near the epicenter of the environmentalist movement. -There, tree-huggers, vegans, alternative-health practitioners, health-food stores and organic farm stands are thicker than Republicans at a Texas shooting range, so nobody is campaigning to repeal the local ordinance banning most exhaust-producing vehicles. -And that's a pity because, in my humble opinion, there would be no locale more fun than Catalina in which to drive a brass car. -More's the pity because the island’s atmosphere could use a little blue smoke enrichment, if for no other reason than to bring it into line with the rest of southern California, which, let's face it, is as much fun as it is because of its indigenous car-culture. But I digress (Always wanted to say that—besides, I know of no other method of getting to the next point other than the round-about way). I suspect that most of us who own and pilot Brass-Era automobiles do so more in spite of the local operating environment than because of it. -Oh sure, there are those fortunates who live in bucolic surroundings where one can putt-putt unmolested down a lonely country road, bound for the general store for a bag of corn meal, but isn’t that more the exception than the rule? -Oh, I can think of other no automobile that would be happier on the highways and interstates of America than the Model T Ford—if not for all the other silly cars that for some silly reason want to go faster then 35 mph. -But oh, the distances we could cover in our Tin Lizzies and Brass Buggies if only we had access to those marvelously smooth ribbons of asphalt! But we don’t. -And that’s why drawing a comparison between the utility of a century-old horseless carriage and that of the baby shoe-shaped invaders from overseas, with their USB-ports and engines that displace liters instead of good ol’ American cubic inches and multitudinous cup-holders, is an exercise in irrelevancy. -Well, so what? -I could use a little exercise. -I should also get a life, but again I digress. At least have some style if you use a golf cart. It's like that here. 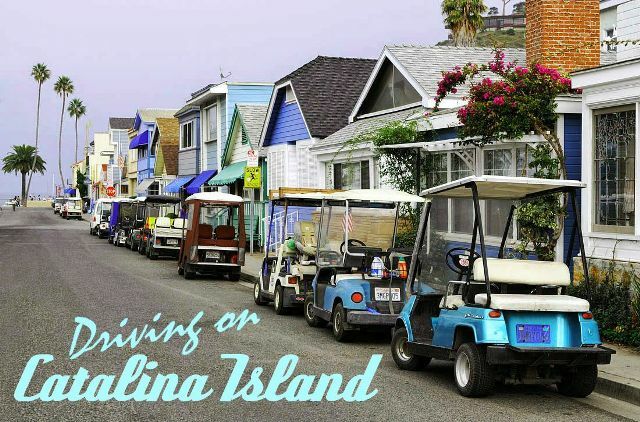 You can drive all over this town on golf carts. It was fun the first few years then I realised the teens getting their first cars drive them like golf carts. We have some of the worst drivers in the south here. 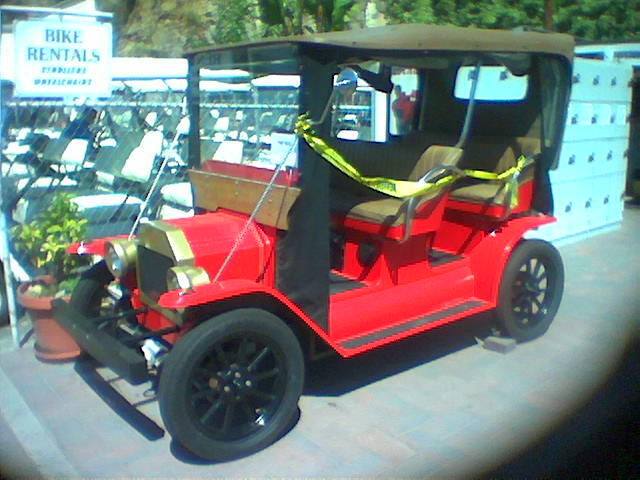 My Dad and I took my 1920 Model T Rajo speedster on the 1976 MTFCA national tour to Catalina. The tour was a lot of fun, we got to drive all over the island to places like, Pebbly Beach, Airport In The Sky, and Two Harbors. Coming back to Avalon and driving down that steep winding grade in low gear was a real Model T era experience. Yes, I remember the MTFCA National Tours on Catalina. I think I participated in two of them. Lots of fun. Bruce Mc. photographed many of the cars on that tour for his upcoming and now famous book "From Here to Obscurity"
The best place to drive a Model T, brass or black, is Bermuda! Aside from the fact that they drive on the wrong side of the road, the speed limit is perfect, the roads are well paved and the scenery is amazing! I know that there have been tours of Catalina. Most of the tourist attractions are at Avalon and the other locations available by bus. I have not been on a tour in a T but question the cost of transporting the car by ferry from and back to the mainland. When I was younger I used to attend Camp Fox YMCA camp which is located at Long Point. We did at least once go from the camp to Avalon by boat. I have also hiked all the way across the island and to the airport from that camp. Does anyone from the Long Beach club or other club in Southern California know whether there will be another tour to Catalina and how much it costs to take a car over and back?